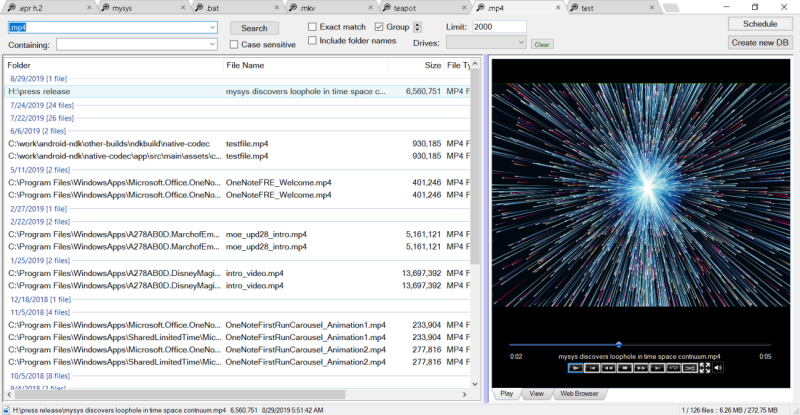 mysys is a fast system wide file finder. It uses sqlite's FTS (Full Text Search) to find files almost instantly. So if you have millions of files mysys will prove to be an invaluable time saver!The first thing mysys needs to do is create a database of all your files.Great care was taken to make this process as fast as possible by scanningseparate disks simultaneously in a highly multi-threaded scheme.If you have mapped network drives a popup will ask which ones to include in thedatabase. Those drives will take longer to index depending on the network connection speed.CD/DVD/Flash drives will not be indexed, only Fixed drives and optionally Network drives.Use the Schedule button to create a Windows Task Schedule so the indexing happens ata time which is most convenient. To delete the task just click Cancel.Once the database is created you are ready to find files, fast!In the top left text box, type any filename and hit enter or click Search.Wild cards are supported such as read*.txt.You can use AND/OR/- like: this OR thatthe - is to exclude like: this -notthatUse double quotes to find whole phrases.Use brackets like: (afoldername or anotherfolder) and (*.c or *.rc or *.h)For that example you would check on the 'Include folder names' option and probably the 'Exact match' option also otherwise will find *.cs, *.css, *.hpp, etc...Because this database is Full Text Search (FTS) you need to know the first chars of thefile name, so if you're looking for filename.txt, *name.txt won't work! Without this limitationwe wouldn't be so fast! *.txt will work however. Possibly a future version will have an option for a slowerbut more flexible search.You can use the Containing text box to search within the files found. Contents are neverindexed but uses a fast highly multi-threaded algorithm.File sizes, Dates and Attributes are all read live off the disk, these are not stored in the database.